These durable and commercial light sets have 50 medium base sockets spaced 24" apart on Black 16 gauge SPT-2 wire. Each string comes ready to plug in and and does not have end-to-end plugs. Each string needs to plugged into its own oulet. This product is perfect for our S14 medium base LED or incandescent bulbs (Not Included). If you wish to order our S14 bulbs please do so of these product ASIN on Amazon - B005MYUAAE, B008O9TKYQ. General Mounting Tips: Best to install the string without the bulbs in the socket to lessen breakage. A guide wire (aircraft wire) is recommended to reduce stress of the string and provide a clean professional look. Make sure and screw in the bulbs squarely in order to make sure that no moisture can jeopardize the functionality of the string. E26 medium base string 100' long with 50 sockets spaced 24" apart. Our E26 medium base string is commonly referred to as an Edison bulb because of its shape and screw in medium base. Make any patio, pergola, restaurant, or special event radiant with our outdoor string lights. Each string is made with 24" spacing between sockets for just the right amount of light in your vintage backyard or patio application. The wiring is 16 gauge making this thicker and more dependable in order to stand up to constant weathering in any environment. 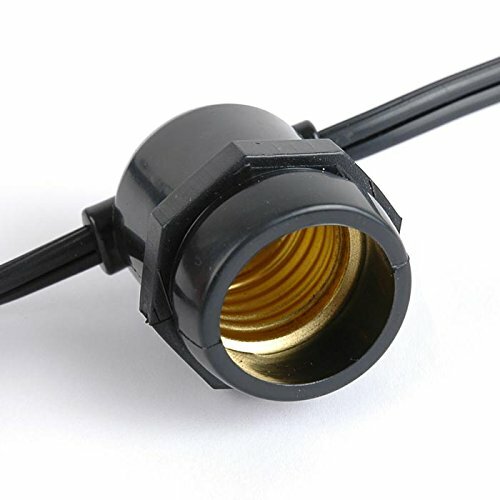 Each socket is made of PVC plastic to provide a watertight seal around the bulb to ensure no defects due to weathering. This string is specifically made for commercial and residential outdoor/indoor use whereever there is need for decoration lighting. Novelty Lights stands by their product 100% and will warranty all of our heavy duty commercial grade products for one full year because our customers satisfaction is our #1 priority. Trust the experts in Outdoor Patio Lighting! If you have any questions about this product by Novelty Lights, contact us by completing and submitting the form below. If you are looking for a specif part number, please include it with your message.